Readers of English are introduced to four fresh titles, and to their takes on conflict, whimsy, and the human condition. 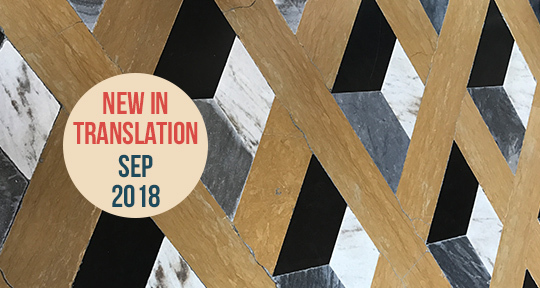 Even as we celebrate 30 issues, join us at Asymptote as we bring you new reviews of exciting fresh releases. Dive into four titles here with us, featuring work set in Russia, the former Yugoslavia, Syria, and Argentina. Keep on following our blog in September to witness the journey our team has been through in the last seven years. On the jacket copy for Ellen Elias-Bursać’s translation of David Albahari’s Checkpoint, Restless Books cites Waiting for Godot and Catch-22 as comparisons. I’ll take them, especially the latter, but if I’m pitching this book to people, I’d offer up authors instead of books, and César Aira and Kurt Vonnegut. They better suggest the whimsy and quick-play changes that fill the brief pages of this novel, the sense that anything might happen, that the rules of the narrative can change in a sentence. Aira brings the freedom and the pace that Checkpoint has and Vonnegut the gentler, more passive characters than the strange and bold people who make up Catch-22. 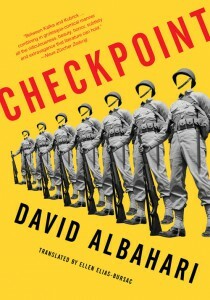 Checkpoint is a quick book, coming in at under 200 pages in small format, and written entirely in one paragraph. It’s the latter that sets the pace. There are no pauses, sentences come and come and come, and so, though it seems as though at times nothing happens, events can rise and fall in an instant. This pace fits a war novel that’s about the absurdity of war, which Checkpoint determinedly and obviously sets out to be. A group of around 30 soldiers marches with their commander to guard a checkpoint, but they have no idea who they are guarding it against, who they are at war with, or even which side of the checkpoint they marched from. They have no known orders, and no way to communicate with their superiors. It’s a paralyzing life, one which soon includes mysterious deaths, refugees, attacks by soldiers of unknown allegiance, severe weather, and misfortunate forays into the surrounding forest.